HARTLAND, Vt. - I solidified my membership into the Crazy Plant Lady Club this past Saturday when I made a six-hour round trip drive to Vermont to view showy lady's slippers in bloom. My defense: Back in March I attended a lecture by Donald Leopold, which I also covered for Frau Zinnie. 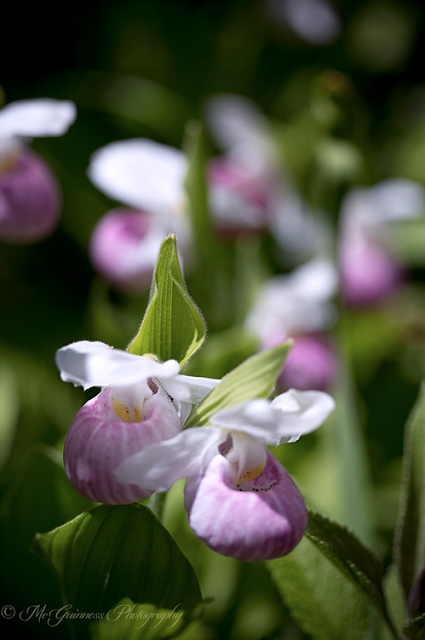 At the lecture, Leopold said that the showy lady's slipper is considered one of the most beautiful North American wildflowers. The pouch on the flower can vary in color from light pink, cherry red or pure white, and is topped with white petals. He told the audience about Eshqua Bog in Hartland, Vt., where a large collection of the plant blooms in late June. "Put it on your bucket list," he advised. The showy lady's slipper (Cypripedium reginae) is listed as endangered in Connecticut, New Hampshire and Massachusetts. 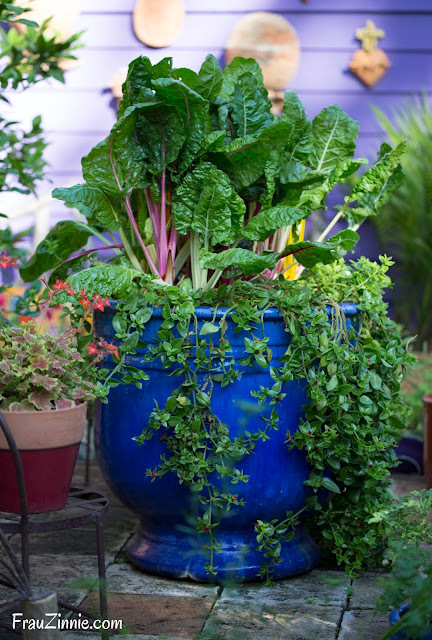 Vermont considers the plant to be "uncommon," one step below endangered. The 40-acre sanctuary is jointly owned and managed by The Nature Conservancy and the New England Wild Flower Society. 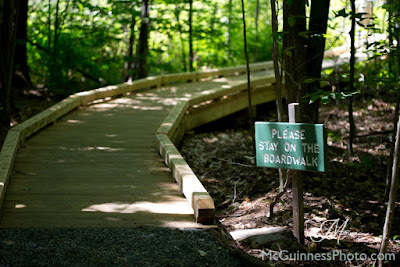 The 466-foot boardwalk was just replaced and a ribbon cutting celebrating the reopening took place on June 20. 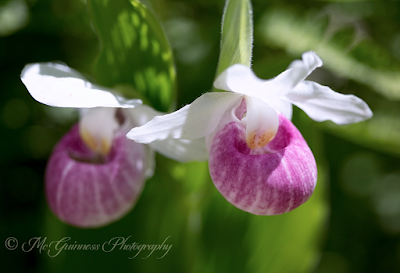 So I decided it was time to see what was so special about the showy lady's slippers myself. After exiting off I-91, the roads gradually went from paved, to loose gravel, to eventually just rocks and dirt upon entering the woods. The main road (Garvin Hill Road) was barely wide enough for two cars to pass through comfortably. There were a few white-knuckled driving moments for this city girl, but it was worth it. The entrance to the boardwalk at Eshqua Bog. That's because once you reach Eshqua Bog (technically a fen, which is alkaline and rich in calcium) and you head out onto the boardwalk, the showy lady's slippers are there to greet you. Large colonies of this wild orchid hug the platform, while water underneath keeps their feet wet. 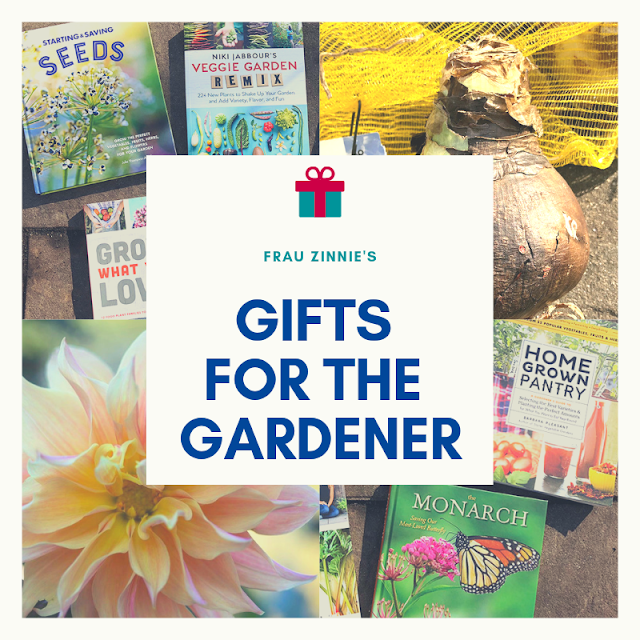 They flourished in the shade with ferns, dappled sunlight or in full sun. So many blooming all at once creates quite an impact. 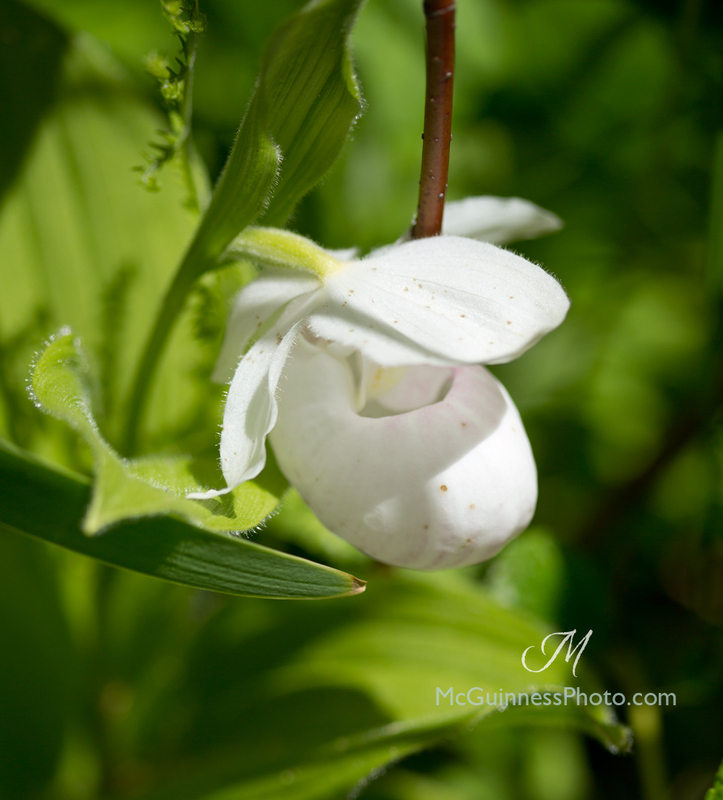 The bog is also home to other wild orchids, including yellow lady's slipper (Cypripedium calceolus) which blooms the third to fourth week of May into the first week of June and the white bog orchid (Platanthera dilatata) which blooms the third and fourth week of June. Wetland plants such as Labrador tea, cotton grass and pitcher plants also thrive in this location. 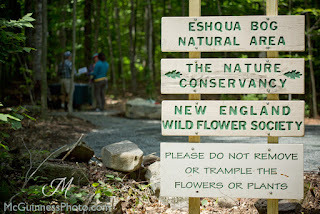 To plan a visit to Eshqua Bog in the future, read more on the Nature Conservancy's website.